The Santana High School boys volleyball team gave a hint that success might follow in the San Diego Section playoffs after capturing this spring's Grossmont Valley League championship with an unblemished 8-0 record. The underclassmen-heavy Sultans seemed to find a nice fit in the Division III field as the No. 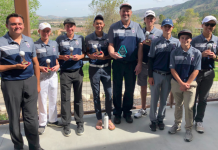 3 playoff seed; the fit proved even better than expected after they upset the top-seeded Bonita Vista Barons to capture the division championship with a three games to one victory May 23 at Canyon Crest Academy. Santana (17-10) prevailed by match scores of 26-24, 25-19, 16-25, 26-24. Baugh and seniors Tyler Kirk and senior Drake Vesco led the Sultans with 10 kills each while sophomore Sage Hicks-Baguio was credited with three blocks. 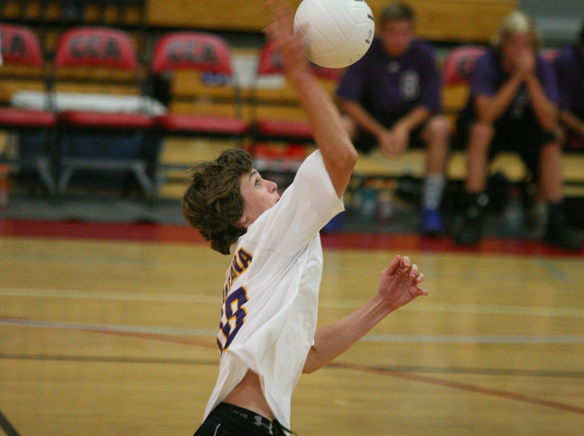 Junior Ryan Kay recorded 10 digs and three serving aces while senior Daniel Shively was credited with 46 assists. Kirk said Santana's three-game sweep of the second-seeded Sweetwater Red Devils in the division semifinals on May 21 – 25-21, 25-21, 25-19 — gave the East County team a big confidence boost heading into the division final. The Sultans, who recorded a runner-up finish in the section's Division II finals in 1998, opened this year's post-season tournament with a 3-1 elimination victory against sixth-seeded Point Loma (13-13) in the division quarterfinals on May 16. Santana won by scores of 25-9, 23-25, 25-19, 25-23. As the opening minutes of the first game of last Friday's CIF finals played out, it appeared the Barons (19-11) might be gearing up for a rout after swiftly jumping out front by a 5-1 margin. But the pesky Sultans, obviously undaunted, promptly began chipping away at the Bonita Vista lead. Santana took the lead at 15-14 and later at 23-22 after falling being the Barons 21-19. The teams battled for the final few precious points after Bonita Vista erased a tenuous 24-23 Sultan lead to tie the game at 24-24. The Sultans won the final two points to secure the 26-24 win and grab the early momentum. The Barons once again built early leads of 3-1 and 5-4 in the second game only to have Santana come back to build imposing leads of 17-9 and 21-11 before finally shutting down a late Bonita Vista rally to claim a six-point victory and pivotal 2-0 edge in games. The Barons finally got their game into gear to avoid an embarrassing three-game sweep. Bonita Vista managed to build some momentum on the strength of a 10-6 edge and then held off a spirited rally by the Sultans, who narrowed the score to 13-12, before powering down the stretch to win by nine points in the third game. 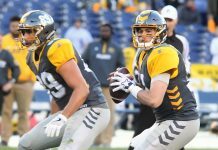 In fact, the momentum appeared to remain on the Barons' side in the fourth game as the division's top-seeded team shot out to a 22-16 lead. But, as in the first game, Santana's pesky young spikers regrouped at the crucial time. The Sultans promptly seized the momentum, tying the game at 22-22. Bonita Vista won the next two points to put the Sultans on the verge of forcing a deciding fifth game by going up 24-22. But the Barons somehow could not nail down that final critical point as Santana magically closed out its first CIF championship with the game's final four points. Kirk led the Sultans with 193 kills on the season, while Kay led in digs with 167 and Shively recorded a team high 752 assists. In the semifinal win over Sweetwater, Baugh and Hicks-Baguio led Santana with nine kills each while Shively racked up 37 assists.